Civil Engineering: Basic principle for the Seismic design of building: Avoid soft- storey upper floors! 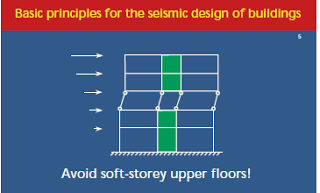 Basic principle for the Seismic design of building: Avoid soft- storey upper floors! Avoid soft- storey upper floors! Avoid soft storey upper floors! An upper storey can be soft in comparison to the others if the lateral bracing is weekend or omitted, or if the horizontal resistance is strongly reduced above a certain floor.